Chapter 1: Introduction Chapter 5: Capital: are translators disinterested? 4.1 Positions are the range of options that any field of cultural activity makes available to producers of culture. These options include the basic cultural elements from which culture producers can choose when they create their own products. Such elements comprise the entire array of genres, themes, motifs, artistic forms or linguistic practices known to producers and consumers of culture in a certain tradition at a specific moment in time. Modes of production are also among these options. In the literary field, for instance, modes of production include private and government publishing, paperback and hardcover editions, publishing in a prestigious book series for established writers and publishing in a series for avant-garde writers, etc. In reality, these options are many and varied and the boundaries between them are not always clear. For the convenience of study, Bourdieu views them in binary terms. Hence, in the literary field, for instance, the following positions can be identified: verse vs. prose, social novel vs. avant-garde novel, politically committed literature vs. art for art’s sake literature, etc. (Bourdieu 1996: 239). 4.2 The variety of options available in one cultural tradition will not be the same as those available in another. This can be a source of a number of problems for translators. For example, drama was simply not an option for producers of Arabic culture until the first half of the nineteenth century. Even when the Arabs launched a massive translation movement from Greek during the Abbasid dynasty (750 – 1258), they translated all aspects of Greek thought, including philosophy, medicine, astronomy, etc., but they left Greek classical drama and dramatic poetry untouched. Dramatic writing was not yet an option for producers and consumers of Arabic culture. It was only in 1847 that the Lebanese Marun al-Naqqash wrote and produced in his house in Beirut a play adapted from Molière’s L’Avare. 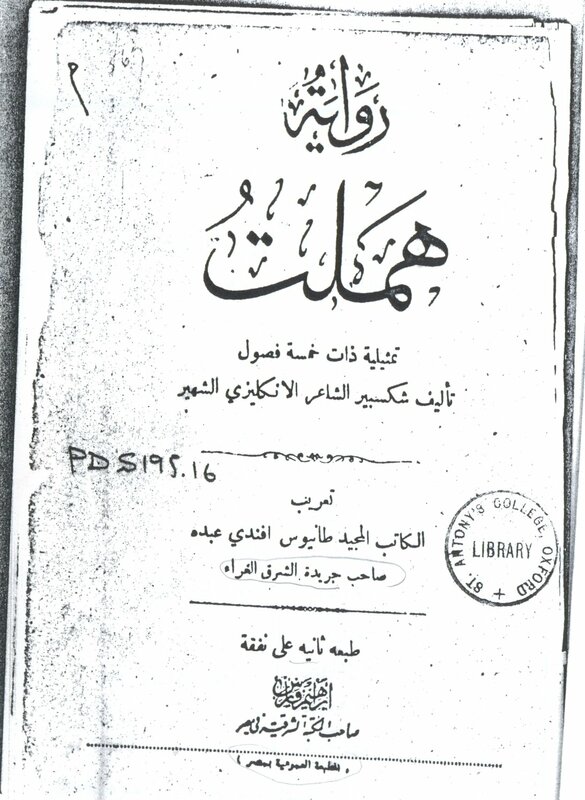 In order to introduce this new cultural product, al-Naqqash, together with Abdu and all the other drama translators operating in the second half of the nineteenth century, had to draw on cultural elements that were readily available in the Arabic tradition and with which Arab consumers of culture were familiar. 4.3 The fact that drama as a Western genre was introduced to the Arab world only through the cultural options (or ‘positions’, to use Bourdieu’s jargon) at the disposal of translators and theatre producers finds evidence in the very terms that Arabs used to designate such concepts as ‘tragedy’, ‘comedy’ and ‘a play’. For Bourdieu, the naming of cultural objects and concepts echoes the vision(s) of culture producers concerning the nature of their endeavour and its end-products as well as the boundaries that distinguish their field from other fields of cultural activity. For an emerging group of culture producers, mobilising around a fresh set of terms designating their new activities and cultural products is indispensable for guaranteeing them a place in the social space vis-à-vis established groups of culture producers (Bourdieu 1984: 480-1). However, the translators of drama into Arabic faced the problem that the terms available to them to denote the new genre all had meanings associated with other cultural products. 4.4 The earliest attempts by the Arabs to name concepts and activities pertinent to theatre show that the terms they came up with were inevitably steeped in the options available in their culture. When Abu Bishr Matta ibn Yunus (died 940 CE) translated the two terms ‘tragedy’ and ‘comedy’ in his Arabic version of Aristotle’s Poetics, he could not help but opt for two words that originally denote two sub-genres of Arabic poetry. The Arabic word madih, used to designate poetry in praise of kings, noblemen, or one’s tribe, was his translation of ‘tragedy’, while the word hija’, meaning satirical poetry, was his equivalent of ‘comedy’. Drawing on vocabulary used in an already existing cultural field, i.e. classical poetry, to name ‘tragedy’ and ‘comedy’ in Arabic seem to have greatly conditioned the way drama translators in turn-of-the-century Egypt conceptualised theatre and the way they packaged it for consumers of their translations. Early drama translators into Arabic took it for granted that translating in verse, or even interpolating versified sections in their translations, was indispensable for the success of their products. No wonder, then, that all of Hamlet’s monologues in Abdu’s versions took the form of classical Arabic poetry with its typical two-part, mono-rhymed lines. Moreover, the idea that ‘tragedy’ is solely about singing the praises of the protagonist seems to have distanced Arabic translations of tragic plays from the very meaning of tragedy in Greek and European drama in which the ‘tragic flaws’ of the protagonists constitute the direct cause of the disasters which befall them. The idealistic characterisation of Hamlet in Abdu’s version as a ‘flawless’ protagonist is illustrative of the role played by the naming of foreign cultural concepts in fashioning our understanding of these concepts. 4.5 During the second half of the nineteenth century, drama translators picked up the word riwaya to designate a ‘play’ in Arabic. This is the term Abdu uses on the front cover (see gloss) of his published version of Hamlet. The use of this Arabic word again shows that translation is conditioned by the positions, or options, available in the target culture. Riwaya has three different senses in Arabic: (a) the recitation of classical poetry; (b) after the rise of Islam, it meant the recitation and handing down of the sayings of Prophet Muhammad; (c) it also means narrating folk tales. Choosing an Arabic word with such complex references, whether consciously or unconsciously, is indicative of three different resources on which drama translators drew for cultural options: classical culture, especially poetry, folk culture and religion. These three cultural resources found their way to most of the translated drama in turn-of-the-century Egypt, including Abdu’s version of Hamlet. Apart from the heavy use of versified speech, unpacking the complex plot structure into a story about the triumph of good over evil shows the unavoidable influence of folk culture on drama translators: the story line in which the protagonist, often represented as the bearer of all positive moral values, faces a series of hardships at the end of which he (the protagonist is usually a man) prevails, is typical of Arabic folk narratives. The effect of religion can be seen in the deletion of all forms of oaths and religious references invoking Christianity. Although Abdu, with most of the drama translators during that time, was a Christian Maronite, he made sure that his translation would appeal to his audience, the majority of whom were Muslims. 4.6 In conclusion, Bourdieu’s two concepts of ‘positions’ and ‘naming’ of cultural objects and concepts provide us with two tools for investigating the options available in the translators’ target culture which unavoidably determine their translation choices. Further reading: Bourdieu 1996; 1984.